One aspect of the game of No-Limit Hold’em that causes beginning players much grief is deciding which hands to play and which hands to dump. NL Hold’em is much more difficult than Limit Hold’em because the value of a hand depends on so many factors other than just the cards in your hand. Despite this difficulty, our coaches believe that following some general guidelines and adjusting from these is a better solution than having no guidelines at all. 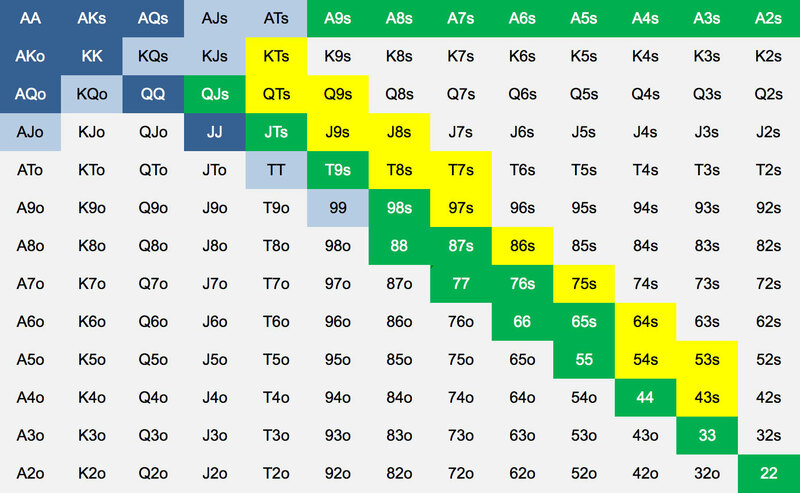 Given that well over half of your profitability in NL Hold’em is based on hand selection alone, we have developed these charts to help you better determine whether to play or fold. The size of your opponent's stacks. How loose or tight, passive or aggressive, your opponents are. Where these opponents are located at the table – for example, does an aggressive player still have to act after you? Your image at the table – for example, how tight or tricky you are perceived. That being said, these charts will serve you well in most typical low-stakes No-Limit cash games, such as games with blinds of $1/$2, and home games. These games typically have several loose players at the table, and good opportunities for winning big pots with suited connectors (hands such as 87s) and pocket pairs. With practice, you will be able to be a consistently winning player with these charts as a starting point. As you improve, you'll find yourself making adjustments to these charts based on the factors listed above, and more. Never use a Limit Hold’em hand chart in a No-Limit Hold’em game. Some hands, like the previously mentioned suited connectors and pocket pairs, go way up in value in No-Limit, and can be played from almost any position in loose, passive games. That is because in Limit Hold’em you might win a decent pot with these hands, but in No-Limit Hold’em you are aiming to win someone's entire stack. Other hands, such as AJ, which might be playable in a Limit game, are much less playable in No-Limit (see additional notes about AJ below the hand charts). Note: It would be a serious mistake to apply these hand charts before reading the Frequent Asked Questions first. Are there other players who have called so far (the more, the better)? Are the players who have called playing poorly after the flop? Will they pay me off if I hit something? Is there an aggressive player still to act behind me (you might get raised and have to fold)? If there has been a raise and no other callers, what chance do I have of using my position after the flop to win the hand even if I don't improve (Chart #3 only)? Why does Chart #2 say to sometimes raise with the hands in yellow, but Chart #1 does not? We have different goals in mind. Using Chart #1, we want to call to encourage additional players to enter the pot. These hands will be immensely profitable when our loose, passive opponents enter the hand, and get trapped when we flop a set, or make a well-disguised straight. When using Chart #2, however, we want to size up the opponents still to act. If they are tight, we can raise. Sometimes, we'll pick up the blinds. Other times, our pre-flop aggression will allow us to take down the pot on the flop. What's the difference between AKs and AKo? AKs means an Ace and King of the same suit. AKo means an Ace and King of different suits. What are early, middle, and late position? Early Position is generally the first 2 (in a nine player game) or 3 (in a ten player game) positions after the blinds. Late Position is the “cutoff” position (to the right of the dealer), and dealer button positions. Middle Position is everything in between. How much should I raise? As a general rule, raise 3 to 4 times the big blind, plus 1 extra big blind for every player who has called before you. So if there are 2 callers already, raise between 5 and 6 times the big blind. What if someone raises after I call? Whether you call the raise depends on how much money the raiser has for you to win, how many other players are involved, and what type of hand you have. As a general rule, if you have a pocket pair, lean towards calling. If there are a lot of other players (and therefore a big pot), lean towards calling. In general, fold suited connectors from early position. Fold hands like KQ that don't play well against a raiser. How do I play from the blinds? From the small blind, play the same hands you would play from late position, plus a few more. But don't call with junk hands like T5o, just because it is “cheap”. From the big blind, if there is a raise to you, play like you would if you had already called from early position. The chart says to fold KQo to a raise. Really? Yes, this hand performs very poorly against typical raising hands. Against AK, AQ, AA, KK, QQ, you are a big underdog. Other typical raising hands like JJ, TT, 99, AJs, are slightly ahead of you as well. The only time you might call or re-raise is from late position, if the opener was in middle or late position, indicating they might have a wider range of hands. I was told to fold AJo from Early Position, why do you say to call with it? Folding AJo is not a bad idea in many games. We included it because, at low stakes tables (even tight or aggressive ones), the players are often playing badly enough after the flop that it can be profitable. 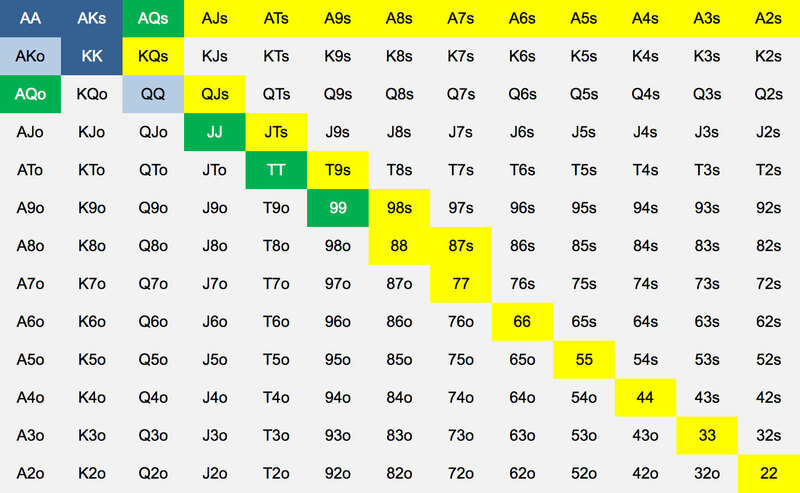 We used data from millions of hands of low-limit poker to analyze this. The same could be said for KQo, ATs, and KJs – you can make a small profit in the long run at most low-stakes games, but folding would be perfectly acceptable from early position. 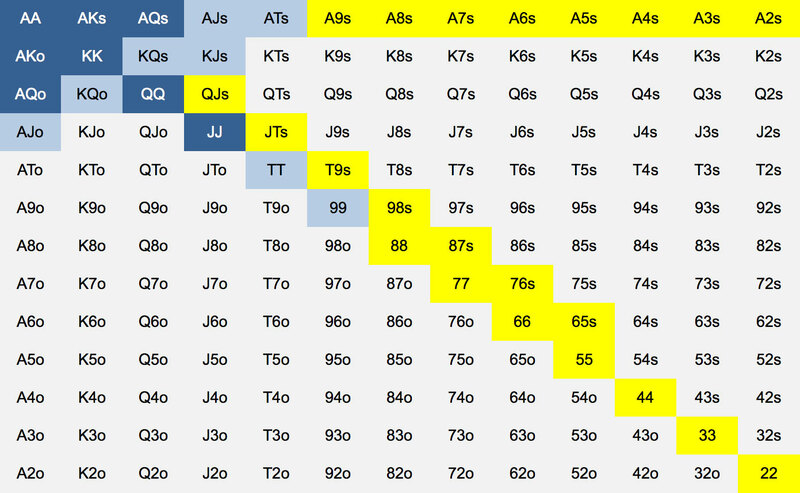 Can I use these charts in a NL Hold'em tournament? The charts would be best applicable to the early stages of a NL tournament, when everyone has a deep stack. In the middle and later stages, they should not be used.